Protesters cut into the perimeter fence Wednesday at Caserma Del Din and made it onto the base before being dispersed by Italian military personnel, the U.S. Army confirmed Thursday. 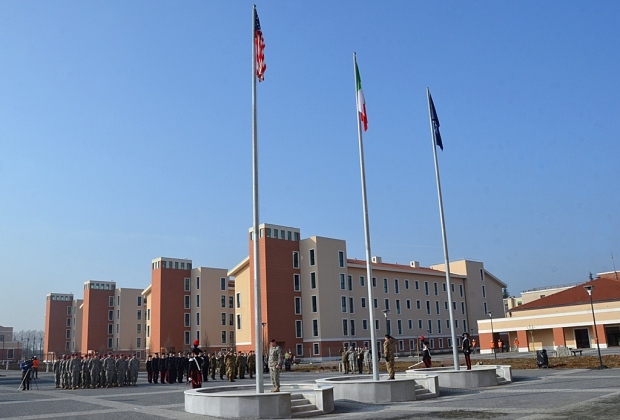 The facility, headquarters for the 173rd Infantry Brigade Combat Team (Airborne) and eventually the home of U.S. Army Africa, opened this summer. Various groups have opposed the U.S. military’s use of the former Dal Molin air field since plans were announced publicly in 2005. Most of the protesters belong to anti-war movements, with some others concerned about the impact on the local environment. “The group entered a few yards into the installation, placing a banner and flags and lighting smoke flares, but peacefully disbanded as carabinieri arrived,” according to Grant Sattler, public affairs officer for U.S. Army Garrison-Vicenza. Protesters had occasionally entered the site — still owned by the Italian military — during construction. Achille Variati, Vicenza’s mayor, an opponent of the Army’s use of the base, denounced Wednesday’s actions in a report by the Adnkronos news agency while saying he still supported the right of people to peacefully protest outside the perimeter. Sattler said Italian authorities were investigating the damage of government property during the incident.